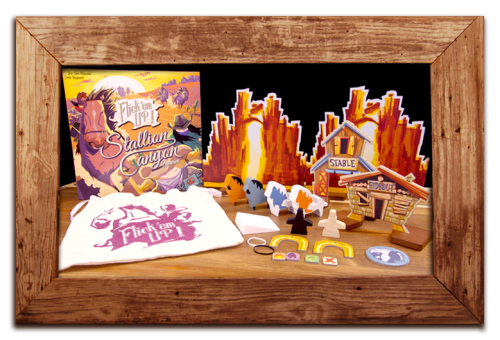 Embrace your inner cowboy and ride into the sunset with this exciting Flick’em Up! follow up! The Flick’em Up! 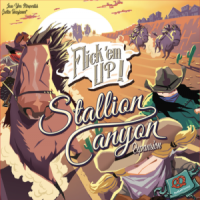 Stallion Canyon expansion brings the rivalry between the law and the terrifying Cooper Clan further into the West. Make place for new characters, new mechanics and more wooden surprises! Up on your Ride, down the Canyon! Discover 5 new scenarios to complete! Capture and tame one of 4 wild horses to help you move even faster under the sun. Escape the line of fire by galloping through great canyons! Two new cowgirls have arrived in town, and you don’t mess with a woman in boots! Meet Anita, the fearless sheriff with a taste for justice. Greet Laura, a merciless outlaw who draws her gun faster ​than an actual bullet! Use the shooting ramp for shooting an opponent down his horse. Mount it and steal the horse from him! Add a Review for "Flick ’em Up! : Stallion Canyon"